Isolatedintra-abdominal lymphadenopathy identified radiologically may be an incidental finding or discovered during a staging workup for a lymphoproliferative disorder. A pathological diagnosis requires tissue obtained either percutaneously or surgically. We hypothesize that laparoscopic lymph node biopsy is a safe and effective diagnostic procedure for solitary intra-abdominal lymphadenopathy. All patients undergoing laparoscopic biopsy for CT-identified intra-abdominal lymphadenopathy at our center from January 2004 to September 2009 were reviewed. Twenty-five patients with an average age of 56 years (range 23-78) underwent surgery; 5 had previously had unsuccessful percutaneous biopsies and 1 had an attempted laparoscopic biopsy in a community hospital. Mean operative time was 70.6 minutes (range 30-180), all procedures were performed laparoscopically. There were no enterotomies or intra-abdominal injuries. Eleven patients underwent retroperitoneal lymph node biopsy, 10 required excision of mesenteric lymph nodes, and one patient each had periportal and perigastric nodes resected. Two patients underwent liver biopsy. In 3 patients laparoscopic lymph node excision was nondiagnostic: 1 underwent a second laparoscopic biopsy, one had a guided percutaneous biopsy, and one known lymphoma had a normal lymph node on pathology. One patient diagnosed with granulomatous disease was later found on bone marrow aspirate to have B cell lymphoma. A single biopsy-proven sinus histiocytosis also had lymphoma on a subsequent percutaneous sampling. The final pathologies are as demonstrated. 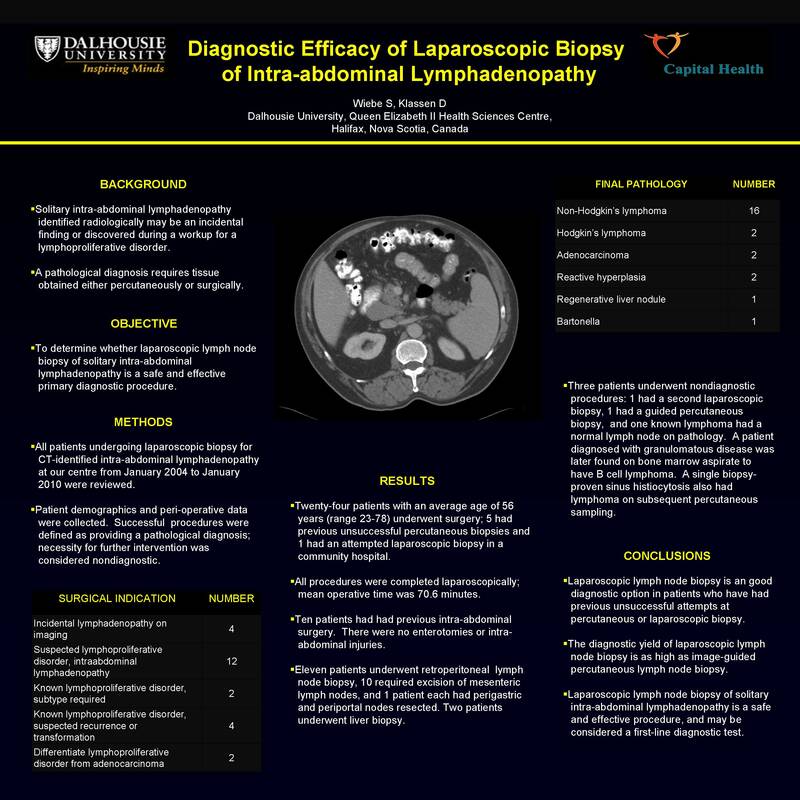 Isolated intra-abdominal lymphadenopathy can be biopsied via the laparoscopic approach safely and effectively. The diagnostic yield is as high as image-guided percutaneous biopsy, and can be considered as a first-line diagnostic test.